Joey Barton and Matt Lowton scored their first goals for the club to inspire the Clarets to their biggest win under boss Sean Dyche. Sam Vokes, Andre Gray and George Boyd were also on the scoresheet as Burnley thumped 10-man MK Dons 5-0 to climb in to fourth spot in the Championship. It was the club’s biggest win since they hammered Nottingham Forest at Turf Moor almost seven years ago and their most convincing triumph on their travels since Charlie Austin netted a hat-trick at Fratton Park in a 5-1 win over Portsmouth in 2011. The away side were in cruise control throughout and were allowed to play as the hosts applied little pressure on the ball. The Clarets simply worked in the gulfs between enemy lines, exploiting the opposition with ease and forging incisions all over the pitch. Barton started the rout on the quarter-of-an-hour mark to register his first goal in nine months. The midfielder capitalised on Darren Potter’s hesitancy, dispossessing the Irishman who had his back to play before closing in on goal and applying a cool finish that beat David Martin at his near post. Before the opener, Vokes had hooked over when stepping ahead of Antony Kay to meet Scott Arfield’s delivery while Rob Hall’s dipping effort at the other end struck the stanchion behind Tom Heaton’s goal. Potter’s invitation simply brought the visitors to life and moments later Vokes glanced a header wide after stealing a yard from Kyle McFadzean to meet Michael Kightly’s cross. Josh Murphy and Hall were the home side’s most impressive performers as they proved troublesome on either flank. And the pair almost combined to clinical effect when Murphy beat Kightly and Lowton to hit the bye-line but Hall could only find the gloves of Heaton from the resulting cross. Kightly and Nicky Maynard saw efforts saved at either end while Gray’s strike was deflected wide after David Jones’s corner fell kindly for the striker who stood unmarked on the penalty spot. The home side had two chances before the interval, with Heaton stooping low to deny Murphy while Hall’s set-piece clipped the wall and drifted wide of the upright. Dyche admittedly made an impassioned speech at the break and, similarly to the game at the Riverside, he got a huge response. Within 32 seconds of the second half the Clarets doubled their advantage. Vokes creating an opening from nothing as he wriggled through Kay and McFadzean before opening his body and slotting neatly in to the far corner. Hall sliced wide and then went within a stud’s length of converting Murphy’s cross but in the next breath MK Dons found themselves three goals down. In the 64th minute Barton swung in the set-piece and Gray had all the time in the world to nod the ball home unchallenged from close range. And the visitors weren’t finished there. Not by a long stretch. Lowton, who has created a number of goals this term, turned from provider to goalscorer when smashing the ball first time in to the roof of the net from substitute George Boyd’s pull back to make it 4-0 in the 71st minute. The home side were reduced to 10 men when Kay was given his marching orders for pushing Boyd to the deck on the edge of the box as the last man. Jones volleyed over the resulting free-kick. 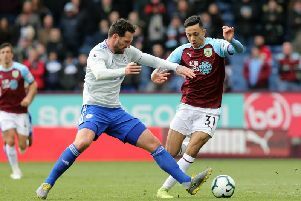 The scoring was then completed with eight minutes remaining as the Clarets worked the ball intricately from the left back slot, Gray broke and fed Boyd to his right and the winger’s rasping strike was too hot for Martin as it hit the roof of the net. Hennings, introduced at the expense of Vokes in the 76th minute, could’ve extended the lead even further when using his strength to shrug off Jordan Spence but the striker fired over the bar left-footed.